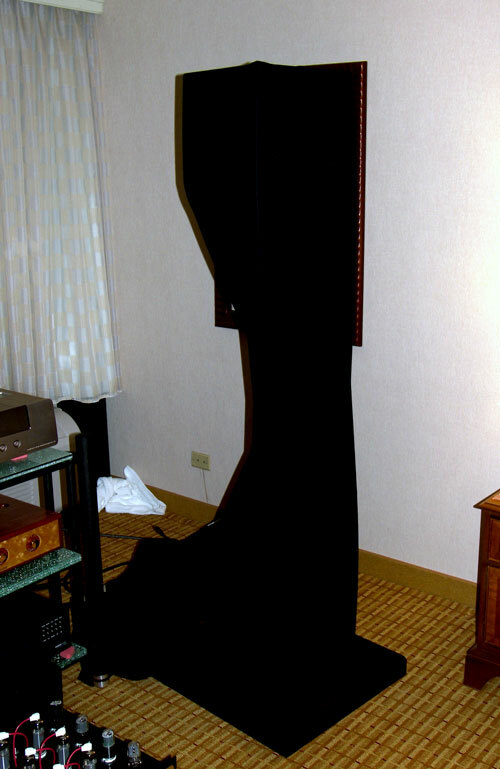 At CES 2009, there appeared in the parking lot of the Alexis Park Hotel “Sol”, the gargantuan rotating musical sculpture. This year, once again at RMAF, from the mind of Aleksandar Radisavljevic, a.k.a. “Romy the Cat” at goodsoundclub.com, comes an oddly endearing lifestyle speaker which appears (and functions) as much like a contemporary lamp as a speaker. It is an active speaker system, powered in this instance by Solaja Audio and Bryston amplification. It does light up, as there are embedded in its arms multi-color LEDs; the base also glows from LEDs. Not only will the light be glancing off the walls, but also the hyper-extended sound, which is uncannily similar to omnidirectional speakers in its vastness. Indeed, the presentation had an “economical MBL” quality to it. The rather unique placement of the drivers is noteworthy. Implementation of the “Can” speaker cabinet is apparent throughout, the bass ensconced in the black tube woofer housing and the mids (four altogether; two firing upward and two downward) and tweeters in aluminum tubes, or “cans” at the end of the adjustable arms. 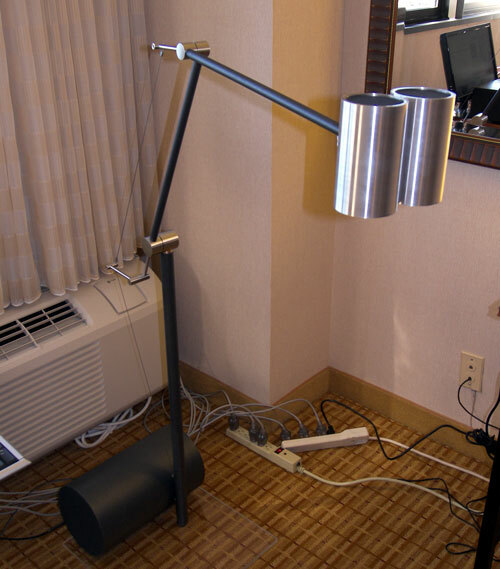 I do mean adjustable as in 720 degree adjustability, quite similar to elbow desk lamps of the 1970’s. The RAAL ribbon tweeter is located between the aluminum midrange housings, the high frequencies ricocheting off the parallel can’s surface! The sound was refreshingly, radically expansive. It’s this kind of creativity and brashness that brings a huge smile to my face! I’m sure I was not the only one who was stupefied, stretching mentally to match the enormous soundstage to the spindly contraption extending into the room! Keep it up, Alex! These kind of ingenious adventures make audio exciting. With the price tag estimated at $4,000 it’s the kind of quirkiness that people can afford. One doesn’t always leave shows with answers; sometimes the questions multiply, especially when the speaker is silhouetted in grill cloth material. The Carnegie Acoustics room reminded me of a spy photo of a new model car wrapped in black on a test track. Though the body of the speaker was invisible, it sure “drove well” with AMR source, McAlister Audio amps and Synergistic Research cabling. Named the Grande Lux – I like the name! – it may or may not reach production, but I cast my vote that it does. It’s a powerful, open baffle hybrid, implementing passive midrange and treble, but active bass. Maybe the mystery of it all added to my enjoyment, but I hope to see this speaker system with an estimated MSRP of $20K revealed in future shows. Thanks for your mention of our room at the show, it was good to chat with you on your “Soundtrack Sunday” journey! I want to clear up the lineup of products that were in the room, so that credit is given where due, and let you know where we are headed with the speaker. First of all, let me say that it was truly an honor to be a part of the first Al Stiefel Legacy Room. I will always remember this as one of the highest points in my life. Here is the official lineup of components used at the show. If you would like specifics just let me know and I’ll round them up for you. – Teo Audio supplied their otherworldly LIQUID CABLE interconnects and speaker cables. – AMR, Dr. Feickert, and PURITY provided the system components. We were blown away by them all. – Billy Bags supplied the terrific stand and rack system. I want you to know that my company’s relationship with Carnegie Acoustics ended on “Soundtrack Sunday.” We are no longer affiliated with them in any way shape or form. The speaker they momentarily named the “Grande Lux AS-1” remains my property. Apparently they are going their way toward offshore manufactured “lifestyle” speakers, while we are designing graphically and sonically-significant hi-fi right here in Colorado. EARGASM AUDIO is the name of my prototype design and manufacturing studio. We are a complete “pencil to CNC” shop. Feel free to call anytime. I like the deHavilland amps more every time I hear them. The smaller room seemed suited more to the Wilson Benesch Curves with the amps; last year this combo seemed lost in the room. Not this time; it was intimate and powerful. 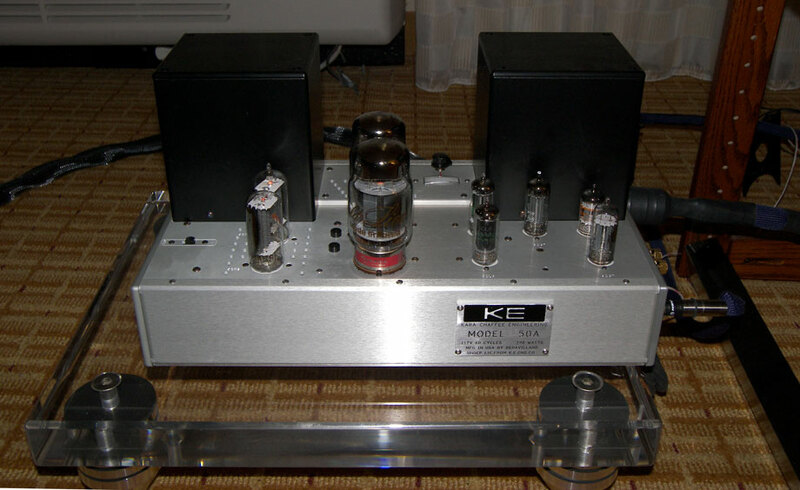 The 50A Signature Mono Amps and Mercury III Remote Line Preamp sang an enchanting song together. Previously I had felt the need for the Curves to be powered by bigger amps, but the deHavillands are challenging that conclusion. They startled me with their fortitude, as well as their golden toned dialect spoken through the Curves. Copyright ©1996-2019 All Rights Reserved.